The Lindum Hotel is located on the Promenade in St Annes on Sea, opposite a host of seafront amenities, whilst also being within walking distance of the elegant Edwardian town center and a short ride from Blackpool. Free WiFi is available on the ground floor in the resident lounges and public areas. Well known for its standard of cuisine the hotel restaurant is open for breakfast and dinner. Bar lunches can be taken in the lounge or on the terrace in nice weather. The daily changing menu offers all home cooked food using locally sourced ingredients whenever possible. St Annes is ideally located on north west coast, very popular with all ages. Lytham is approx 3 miles along the coast with its mix of shops, bars and restaurants. 4 miles in the other direction is Blackpool, with its Tower, 3 piers, Pleasure Beach and Illuminations. We are well served with a frequent bus service and the train station links us to Preston and the West Coast main line. Golfers have a choice of 4 courses in the vicinity, including Royal Lytham, a host of the Open Championship. All 78 rooms are en suite with single, twin or double beds. 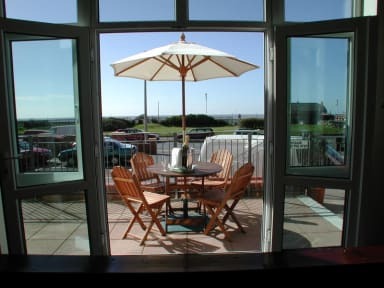 Sea views are also available with impressive views of the coast and Southport across the water. All rooms have colour tv, tea making facilities and telephone. Payment upon arrival by cash, credit cards, debit cards. Visa, Mastercard, Maestro & Switch are all accepted (No American Express). Reception 8.30 – 22.30 with a night porter on duty outside these times.